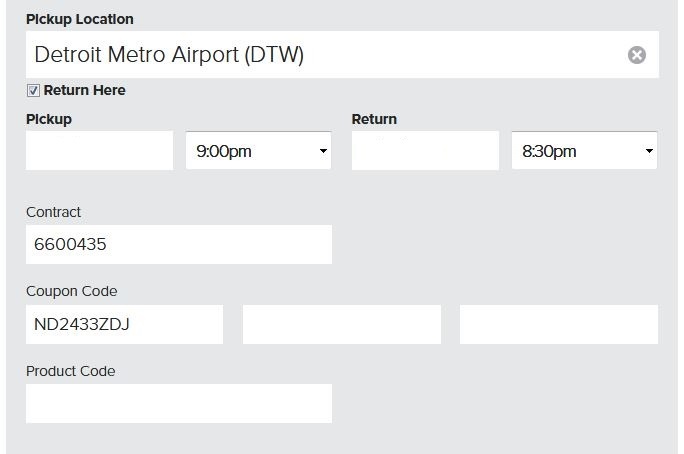 If you’ve been around miles and points travel at all, you are probably familiar with Autoslash. 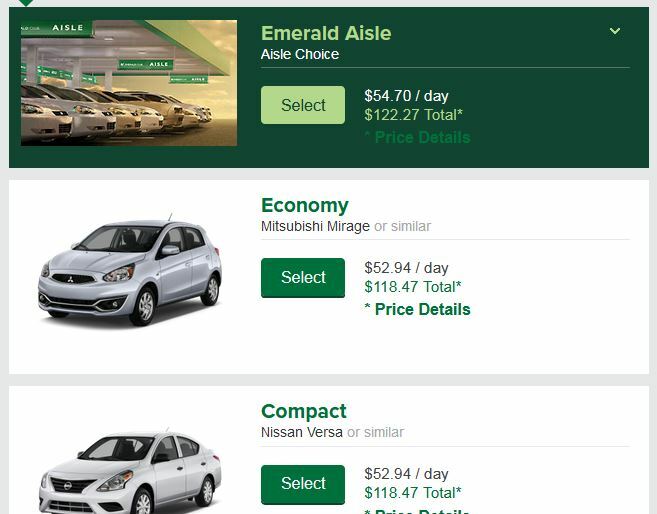 It’s an awesome tool for finding the best publicly available car rental rates, and then monitoring rates and sending a notification if a better rate comes available for your rental. Car rental companies may prioritize direct bookings if they run out of cars. We had this happen on an Autoslash/Priceline Avis booking in Belize this spring, and we wound up getting walked to a different (local) agency and getting a smaller car for the same price. Unless you do some digging around and figure out how each system works, you may lose the ability to skip the line, get points, etc if you book through a 3rd party such as Priceline. For reference, these are the rates on Priceline and National without going through Autoslash. Clicking through took me to this Priceline page. If you scroll down, click add-ons and then rewards points and discounts, you can see the discount codes. Much better, and I can go ahead and pay $6 to skip the counter and get on the road! 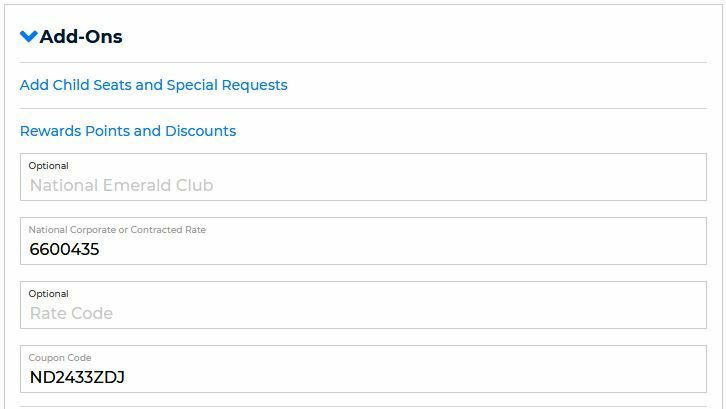 Notice the rate is for ‘National.com last minute specials’, not some corporate code that I’m not technically eligible for. This is the best method I’ve found to get the best possible rate while avoiding the headaches that could come with ‘hacking’ car rentals further. Also, I can still plug my National confirmation in at Autoslash to get updates for lower rates. But, it turns out this isn’t a great idea for all of us to use. 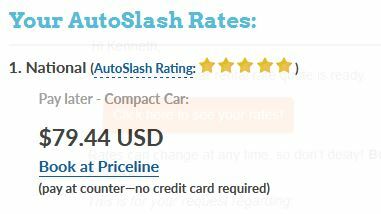 Autoslash can exist because they earn a commission from Priceline on these bookings. Some of the coupon codes are likely public, but others of the coupon and corporate codes may be specific to Autoslash, so using those could amount to stealing. Also, you can earn points and benefits and skip the line on these postpaid Priceline rentals, and even use the Emerald or Executive Aisle with National. Thanks to Jonathan from Autoslash for commenting with a link to this blog post that covers some of that info. But, a big part of the reason I went digging for a better way was because this info is hidden – I couldn’t find it digging around the autoslash site for a while even when I knew it existed! And, based on info on Flyertalk the National Aisle benefit apparently just works if you use the drivers license in your profile and rent an intermediate car. Autoslash could certainly do a lot better job of letting occasional users know how to use their service while maximizing the renter’s benefits! It’s been just about forever since I posted, I’m glad to see the blog still works! Maybe I’ll post some more stuff if I feel like doing some trips reports, or stumble on some more overlooked-but-shareable tips. Sorry you had an issue in Belize. We’ve never honestly seen that before. A booking via a 3rd party should be treated identically to a booking directly with the car rental company. 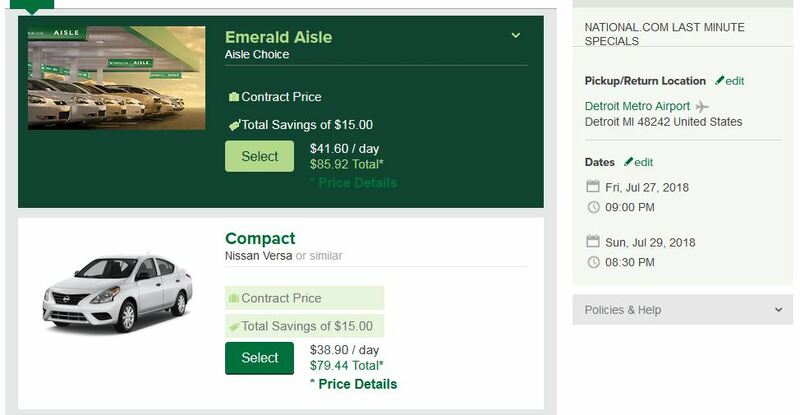 Also, one point of clarification… You can add your Hertz Gold, Avis Preferred, National Emerald Club member number on the Priceline checkout page (https://www.autoslash.com/blog-and-tips/posts/how-to-ensure-loyalty-program-credit-when-booking-through-priceline) so you can skip the counter, use Ultimate Choice/Emerald Aisle, earn points, etc. on any booking through Priceline just as if you booked direct. Of course, you’ll pay far less when using AutoSlash. Also note that we’re now offering special direct-book deals (“Slash Deals”) that can be even lower than the pay-later deals we offer through Priceline. They will show up in our quotes when the rate is below the best pay-later deal we can find. We look forward to saving your readers money on their rentals! If something like this ever comes up again, you should email our support team at support@autoslash.com and we’ll immediately investigate. We’re always trying to improve, but we can’t fix things if we don’t know about the problem. Glad to see you’re actively responding here. I’ll email support in the future. I really, really, really want to see you guys succeed, so I’ll continue to support you however I can. It’s important to point out here that AutoSlash makes a small commission on each rental from Priceline. By taking the codes we provide and then using them elsewhere, you’re essentially advocating stealing from our company. This is how we pay our staff, our hosting services, provide support, etc. If everyone were to do what you’re advocating, we could go out of business in a matter of months. Please see my other post on how to both support us as well as ensure that you get all the benefits of using your loyalty memberships. We appreciate everyone’s support. Did this post get edited a ton? It’s a confusing read. Previous post: Did LAX just get a lot better for Southwest positioning flights?